Journey to YouTube Personality - Three Months In - Farm & Culture Co.
Have you ever thought about making YouTube videos? Yes, but geez who has the time? Yes, but I don’t know how to set the clock on my oven let alone make a video. Yes, but I need to get my hair done first and bleach my teeth or something. Yes, but there’s a mountain of laundry to get done first. Lots and lots of “yes’s” and lots and lots of excuses why I never actually did it. I think the real reason was because it’s cringy and embarrassing to put yourself out there like that. And then that little voice of self doubt starts to creep in. Will anyone even care to watch it? I probably won’t get any views or subscribers, ugh, more embarrassment. But what should I do with all of this ambition? Is this it for me? Am I having a mid-life crisis? And then the unthinkable thing happened- my kombucha bar was in a sales slump for the first time since we opened. Up until then we were expanding and ramping up. Suddenly it was time to pull everything back, way back. The slump sucked but I gained some extra time. I listened to books like Outliers, Grit, The Compound Effect, and most recently, 12 Rules for Life: An Antidote to Chaos. I needed these books to keep me feeling optimistic about humans and life. I knew I wanted to extend my reach and the only real way to do it was online. I started listening to audible books by Gary V (finally- my cousin had given me this book like 2 years ago) and got pumped about the online world. With Gary I started to think that at the very least, embarrassing or not, any YouTube video that I put out there is for my family. My boys will look back on them someday and see what I looked like at 45 years old, hear my voice. It will mean something to them. I called in my guy Rob at Enlarge ​M​edia because let’s face it I’m going to need someone to make me do it. He’s like a personal trainer. Without him, knowing he’s waiting for me, on my dime of course, I would probably still be trying to program the clock on my oven! So I have my videos now and the truth is I LOVE THEM. Yeah, they are totally embarrassing and I can barely watch them. There are actual moments when I feel bad for my kids and husband. But they don’t. 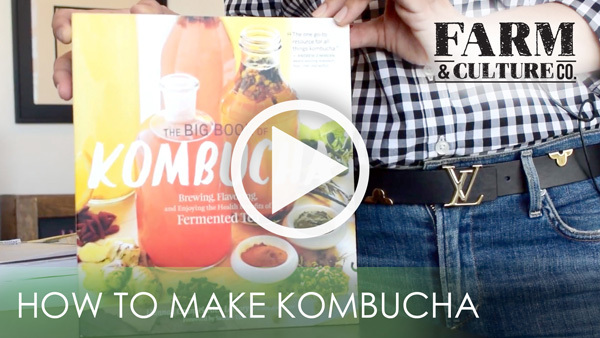 People watch them and send me messages and share their story with me about kombucha and health and all th​e stuff that I LOVE. I started to remember why I got into the kombucha business to begin with, you can actually change someone’s life- it’s that powerful. It tastes good too! ​Please subscribe to my channel so you can watch all of my new recipe videos and ​share this journey with me!